Solar energy production is growing worldwide – overall capacity increased by a third in 2016, with the global installed photovoltaic (PV) capacity reaching 301 GW. As PV becomes more cost effective and a commoditized alternative for electricity production, many building owners are seeking to incorporate PV systems for self-consumption—consuming the energy as it is being produced. This post explains the remarkably simple operation of an electrical installation with a photovoltaic system for self-consumption. During the day, while the sunlight and PV panels are producing electricity, the electrical installation is powered both by the grid and the PV system. These two sources operate in parallel, with no transfer of supply from one source to the other. To facilitate this, inverters convert the DC electricity produced by the solar panels into AC electricity. The PV inverters synchronize their output power with the grid voltage and frequency to avoid mismatch and stability issues. They also perform several other important control functions. Beyond that, there is no need for specific equipment to manage the flow of electrons – this happens naturally, following the basic electrical principles of voltage, resistance, and current. The PV-produced power goes to the loads, as the electricity takes the path of least resistance. The loads consume the local PV production and draw any additional electricity, if needed, from the grid. If the PV production exceeds the load consumption—on weekends, for example—the excess electricity goes to the grid, for which compensation also may be possible. (See “What to do with photovoltaic renewable energy and why your decision matters” for further explanation.) If, however, the contract with the energy supplier does not allow injection of electricity to the grid, PV production should be curtailed at these times. 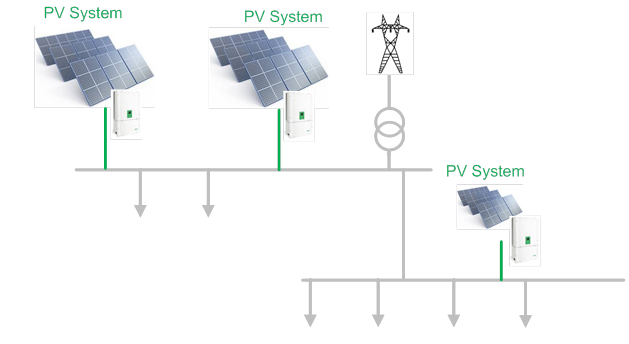 Figure 1-Electrical installation with PV production for self-consumption. At night, when there is no PV production, the PV inverters do not operate and the electrical installation is supplied by the grid only. When there is a loss of electrical power from the grid side, and if no other local source is able to provide backup power, the grid-tie PV inverters disconnect rapidly and the electrical installation is no longer supplied. Although this may at first seem counterintuitive, it addresses a serious safety concern. In case of utility supply loss, installations with local generation are required to guarantee that they do not inject power into the grid to keep utility workers safe. For installations with PV production operating only grid-connected, this safety feature can be met by a dedicated protection device installed at the local sources’ feeders, at the incoming utility line of the electrical installation, or by the PV inverter(s). Most PV inverters have integrated anti-islanding protection, which disconnects the PV inverter in the event of a power outage. The presence of this protection and its standard compliance is provided by the PV manufacturer. Schneider Electric, for example, offers several types of inverters designed specifically for PV installations. Click to learn about our string inverter for commercial buildings and our adaptable single-phase and three-phase hybrid inverter for residential and commercial, grid-tie and backup power applications. Today PV installations cannot ensure standalone operation of the electrical installation in off-grid mode because the PV energy produced is volatile, predictable but unplannable, and has limited control capabilities. To provide an off-grid operation, PV installations must be associated with another major and stable source such as storage or a generator. Operation of such an electrical installation in both grid-connected and off-grid mode is more complex, and will require a specific electrical installation design, an additional control system, and an effective protection plan for each operating mode. To design the right PV system, specifiers and consulting engineers need to understand how to size the system, what equipment is required, how to integrate the PV to the electrical installation, how their customers want to operate the PV system, and more. Read the new Photovoltaic chapter of the online Electrical Installation Guide, which includes typical architectures and state-of-the-art sizing guidelines. Future posts will further explain the details of PV system operation. Why You Should Design Your Renewable Energy System for Self-Consumption (Vive la Difference!) What to do with photovoltaic renewable energy and why your decision matters Photovoltaic equipment: What are the hazards and how can you prevent them? Photovoltaic equipment safety: Always err on the side of caution!